Publish feature service data that can be used when working with maps offline. In this tutorial, you'll learn how to set up your feature service data so that it can be used when working with maps offline. You'll set up a fictitious enterprise geodatabase for the purposes of managing shoreline bird sightings. Author a map document that supports web editing. This involves designing the map document to be compliant with the feature service. 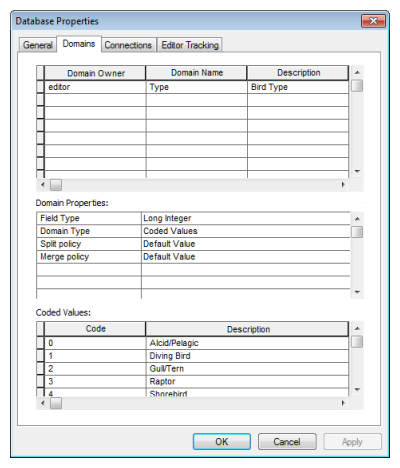 In this tutorial, the feature service allows users to add and edit bird sightings in your enterprise geodatabase. 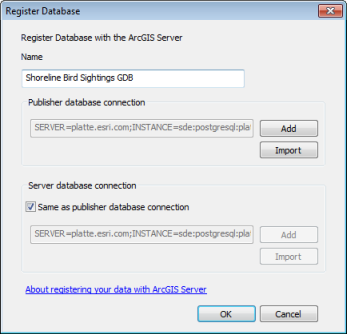 Prepare your enterprise geodatabase for publishing to ArcGIS Server. This involves setting up the data to support the feature service sync capability, connecting to ArcGIS Server, and registering your database with the server. 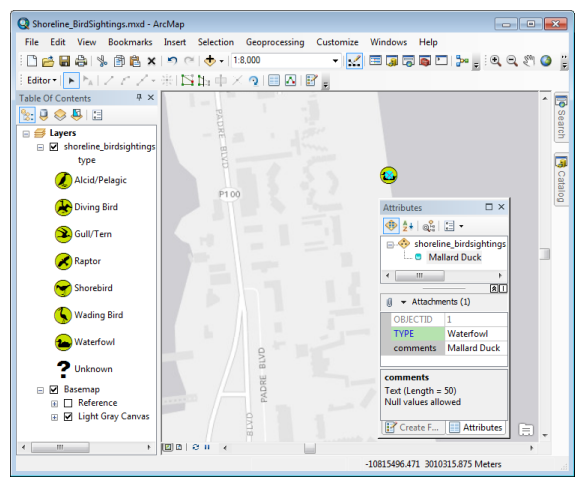 Publish your map document as a map service with Feature Access and sync capabilities enabled. This creates a feature service endpoint through which client applications can edit the bird sightings in your map while offline. Global IDs need to be added to your data to use your feature service locally in a client application. This allows the edits made to your database to be uniquely identified. Double-click your geodatabase connection in the Catalog window to see its contents. Right-click the shoreline_birdsightings feature class, and choose Manage > Add Global IDs. On the Confirm Add Global IDs dialog box, click Yes. Since the data in your database is nonversioned, you'll need to enable archiving for your feature service to be used locally by client applications. Archiving records changes made to the data, which allows the local data to be synchronized back to the feature service. To enable archiving, right-click the shoreline_birdsightings feature class, and choose Manage > Enable Archiving. As part of this step, you'll also enable the Sync capability. This allows the data in your feature service to be used offline in client applications. In the left pane of the Service Editor, click Feature Access. On the Feature Access dialog box, enable the Sync capability. Your feature service is published to ArcGIS Server. When the publishing process completes, you're ready to consume your shoreline bird sightings feature service in client applications. You can also use a client application to create a local copy of your features for offline use. ArcGIS clients and developer SDKs will progressively add support for the sync capability in feature services, which was introduced in ArcGIS 10.2.1. The first clients to support working with maps while offline are Collector for ArcGIS and ArcGIS Runtime SDKs. You cannot enable the sync capability on feature services published prior to ArcGIS 10.2.1. Other clients can access the sync capability through the ArcGIS REST API. If you use ArcMap to edit feature services that are part of an offline editing workflow, be sure to keep the ArcMap editing option to Automatically save changes after each edit enabled. If you disable this option, synchronization from any other client will be blocked until you close your edit session.